No matter your age, you probably have lots of questions and concerns about saving for retirement. How to save for it, what options are available, and, most importantly, how much money should you be socking away? One of the most common ways to start saving for retirement is through an employer-sponsored 401(k) plan. Most companies offer them, and for most people, this is their sole retirement savings account. But with so many options, unfamiliar terms, stipulations, and rules, 401(k)s can be mystifying even to more financially literate savers. Here, we’ll answer one of the more common questions. What’s the Ideal Amount to Set Aside? Of course, this answer will differ depending on retirement goals, existing resources, lifestyle and family decisions, but a common notion is to set aside at least 10% of your gross earnings into a retirement fund as a start. When finances and salary allow, upping contributions to 15% (or more) may be ideal for some savers. In any case, if your company offers a 401(k) match, you should contribute at least enough to get the full match—it’s free money, after all. Many companies (though not all) offer a match, so be sure to check if your plan features one if you aren’t sure. Then at least make it enough to get all of the match. You can always ramp up or scale back your deferral rate later. Many plans require a 6% deferral to get the full match, and many savers stop there. That may be enough for some savers given their other resources or situations, but for most, it probably won’t be. If you start early enough, given the time it has to grow, even 10% may add up to a very nice nest egg—especially as your salary grows. But most people agree that more is better—15% or even 20% should be your goal, some say. If you start saving later in life, especially when you’re in your 50s, you may need to increase your contribution amount. Luckily for late savers, there is an opportunity to catch up that allows you to contribute more annually than is usually allowed. As of 2019, the limit on catch-up contributions is $6,000 for individuals who are age 50 or older any day of that calendar year. For example, if you turn 50 on or before Dec. 31. 2019, you can contribute $6,000 more than the $19,000 401(k) contribution limit for that year for a total of $25,000. There are indeed many variables to consider when thinking about that ideal amount for retirement. Are you married? Is your spouse employed? How much will you expect from Social Security benefits? Retirement age calls for a certain amount of comfort, but this also varies by lifestyle. Will you spend most of your time gardening at your home, traveling, buying a boat, or perhaps riding a motorcycle cross-country? Will health concerns lead to big, unexpected bills? All of these factors should be taken into account when planning for retirement. However, regardless of your age and marital status, financial advisors agree that between 10-20% of your salary is a good amount to contribute toward your retirement fund. Most financial planning studies suggest that the ideal contribution percentage to save for retirement is between 15% to 20% of gross income. These contributions could be made into a 401(k) plan, 401(k) match received from an employer, IRA, Roth IRA, and/or taxable accounts. As your income grows, it is important to continue to save 15% to 20% of your income so that you can invest the funds. 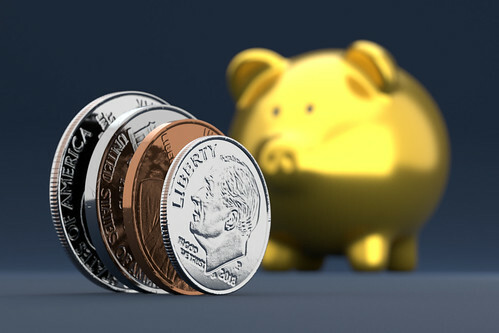 Worth noting is the 2019 IRS limits for contributions: the elective deferral (contribution) limit for employees who participate in 401(k), 403(b), most 457 plans, and the federal government’s Thrift Savings Plan is $19,000 (up from $18,500 in 2018). As noted, the catch-up contribution limit for employees aged 50 and over who participate in 401(k), 403(b), most 457 plans, and the federal government’s Thrift Savings Plan remains unchanged at $6,000. The limit on IRA contributions is $6,000 (up from $5,500 in 2018), with a $1,000 catch-up contribution for those 50 or older. Planning for retirement—and doing it early—is really important. If done properly, and with some financial sacrifices, you can ensure a nice quality of life in retirement. The most important thing is to contribute as much as you can as early as you can and be sure to take full advantage of your employer’s matching contributions if any. Besides a 401(k), you may want to look into opening additional accounts such as an IRA, Roth IRA, or other vehicles or investments. If all of this financial planning seems overwhelming, it may be a good idea to look into a fee-only financial advisor for advice on how to proceed when your options, resources, and needs increase. Our team at Matisse Capital is here to help guide you into retirement. Previous post: Sources of Leadership Power – Are You Using the Right One? Next post: Email Scams – How Can I Protect My Business?